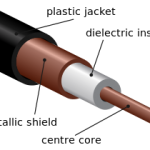 Coaxial (coax) cable is used in older computer networks. Coax cable carries high frequency signals than twisted-pair cables and has a central core conductor of solid wire enclosed in an insulator, which is covered by an outer conductor of metal foil. This outer conductor completes the circuit and the whole cable is protected by a plastic cover. Though the coaxial cable has higher bandwidth, its attenuation is far higher compared to twisted-pair cables. It is widely used in digital telephone networks where a single cable can carry data up to 600 Mbps. 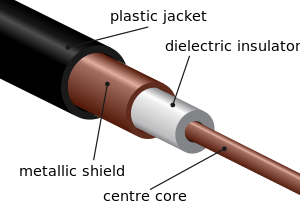 Coax cabling requires a special connector called a BNC connector; it is used to connect the end of the cable to a device. These cables are categorized by RG (radio government) ratings. RG-59 used for Cable TV, RG-58 for thin Ethernet and RG-11 for thick Ethernet.